Did alien organisms rain down in a strange red dust on northern India? At least two scientists think so. It all started when "scarlet showers containing the red specks hit parts of India in 2001. Researchers said the particles might be dust or a fungus, but it remained unclear." A new paper, however, "assesses various explanations for them and concludes that the specks, which vaguely resemble red blood cells, might have come from a meteor." Strangely, the cells contain no DNA – yet appear to be biological. Could this be close encounters of the viral kind? Space flu? Or the seeds of an alien botany, aterrestrial gardens waiting for design by landscape architects? Vast, tentacled hedge-mazes spreading through the Indian Himalayas. The BLDGBLOG Guide to Alien Topiary. (Spotted at Archinect; see also BLDGBLOG's look at our own alien planet). Hrolf eyed the fast approaching planet worriedly. The gnarlydrive had been acting up, and the wing deployment system was broken. It was the only water world within three parsecs, but he'd probably should have taken his chances and tried a jump to Xarth -- at least there he'd be sure of finding a good orbital docking station. But his expendables were mostly expended, and this planet did have an orbital facility, even if he couldn't talk the local lingo, or raise anything on the standard ATC freqs, so Urth was where he decided to go. Half an hour later, he knew he was in trouble. The drive wouldn't put him into orbit with the station, which turned out to be just a half-empty six-being outpost anyway, and how odd was that? His brick-red fingers tapped the control screen. Maybe he could dive straight in (the ship was taking care of that part OK), and then, when the heat shield was near failure, fire the gnarlydrive in utmost emergency overdrive and slow down enough to bail out. It was a big risk. Fire too soft and the machine would burst like a ripe calabamelon when it hit low atmo. Fire too hard and he'd turn into a thin paste of red goo. He wasn't even sure that the gnarlydrive, having a certain personality of its own, wouldn't do both. He waited. The big blue marble rushed toward him. He waited. He was aimed straight at a triangular-shaped peninsula.He hoped there'd be spare parts available. The first angel blew his trumpet. Hail and fire, mixed with blood, came pouring down on the earth. There was no hail or fire. Also, the rain only LOOKED like blood. If the cell-like forms they found actually had blood-like properties I'm sure the people analyzing it would know by now. The text of revelations wasnt meant to be taken literally. hail could be any solid object, and the fire could very well be components of a particular combbustion of materials. Keep in mind, this material could potentially be dangerous! According to the published results (http://arxiv.org/ftp/astro-ph/papers/0312/0312639.pdf ) this material reproduces dramatically at 300 C. It does not degrade over time and can thrive off both organic and inorganic compunds. If this material reproduced at room temperature it would soon wipe out every living thing on Earth! That sounds kind of fun, actually. what in hell is this about alien rain. Does any one believe this. 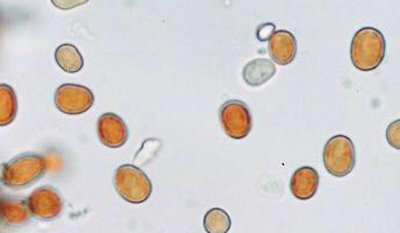 Quite by accident I compared the pictures of the "bood rain" (spores) whatever you call them to the pictures of the bacteria MRSA (Associated Methicillin Resistant Staphylococcus Aureus)? -- The pictures look a lot a like. Hey, maybe its germ warfare. These cells more closely resemble yeast, I am a Microbiologist. It definately is not red blood cells, they are not concave with the tell-tale hemoglobin pull. Fungus is among us. Some fugi are red, which could help explain the color of the rain. PS, they in now way resemble MRSA, a common staphyloccocal species. They are uniform, cocci (round, perfectly) and hang in clusters resembling grapes. All they look like to me are the membrane of a cell with some red stuff in them. That's not a cell, I think liposome is a more accurate word for them. They aren't alive, just a little bag made of a phospholipid by-layer. Perhaps there is a more prosaic explantion for the red rain: fallout from incomplete incineration of chemical waste at the industrial zone in Eloor. The pattern of fallout fits with the prevailing winds. The composition of the raindust matches a mixture of burnt chemical waste and fly-ash or clay. The morphology is exmplained if microparticles of clay coalesced around an aerosol of burnt organics as the incinerator plume cooled. And the 'reproduction' is simple physical cellular replication, as researched, for example, by Jack Szostak at Harvard. Incomplete incineration wins hands down under Occam's razor, but Louis's hypothesis was fatally flawed from the outset by the fact that although small particles in the uppoer atmospher would take a few weeks to fall to earth they wouldn't fall over the same area. More puzzling than the red rain is why so few people seem to have considered industrial pollution. If you read the original paper, you will see images which exactly resemble red blood cells. They contain no DNA as RBCs have no nuclei. Perhaps a plane load of blood products flying in the lower atmosphere emptied its cargo, or crashed. Perhaps it is blood raining from the sky, a sign of the end.